Where should you be at on the full moon day of Thadingyut, 28th October 2015? If you have not decided already let us give you an insight on where you should be. The biggest Pwal Zay (Night Bazaar) in town displaying Myanmar traditional snacks such as A Kyaw (Tempura), Yay Mote (Very Thin Crispy Pan Cake) & Kouk Hnyin Kyi Touk (Sticky Rice in Bamboo). Signature Mohinga is available as well and Burmese Ferris Wheel is something you should look out for as watching it will give you thrill. The most crowded yet traditional lighting festival takes place at Shwedagon Pagoda, the landmark of Myanmar. The event starts from the morning as early as 5 AM with the alms offering to Lord Buddha while waiting for the sun to rise. Evening would be the event of lighting 9000 oil lamps to the Pagoda. It is quite a spectacular sight to witness even though it’s crowded. If you want to avoid too much crowd then may be Swal Taw Pagoda could be your option. Swal Taw Pagoda starts 9000 lights not too long ago. Since 2014, Union of Myanmar Travel Association organized this 9000 lights festival with the help of tourism experts and companies. Comparing to Shwedagon Pagoda 9000 light festival, Swal Taw night lighting festival is less crowded and you could ask anyone that looks local for the insight on history and traditions of the festival as most of the travel guides will be participating in the lighting festival. They will be more than willing to share their knowledge on the auspicious day. The most extravagant and one of a kind celebration on the full moon day of Thadingyut is the pagoda festival dedicated to Phaung Daw Oo Pagoda. Five Buddha images will be taken on a bird (mythical Hamsa Bird) like barge through the villages in and around the lake. The most unique boat race in Asia is also hosted at Phaung Daw Oo Pagoda during festival. To find out more on the Phaung Daw Oo Festival and Boat Race please click here. 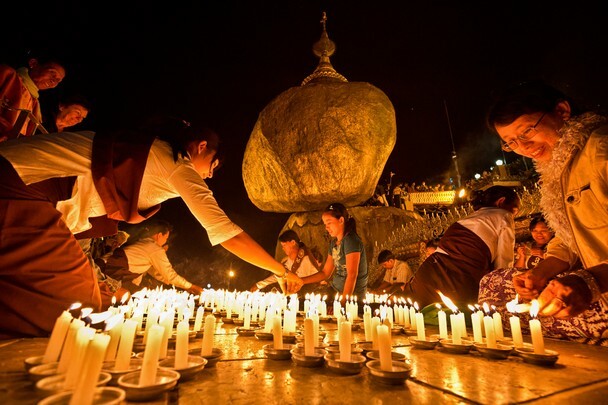 It is an event on the top of the mountain where pilgrims offer 9000 lit candles and 9000 flowers to the Golden Rock Pagoda on the night of full moon day. On the next morning, rice, sweets and other snacks are offered. The platform and passage of the pagoda are usually filled with visitors from all over the country. The Golden Rock Pagoda itself is magnificent enough to attracts thousands and thousands of international and domestic visitors every year. 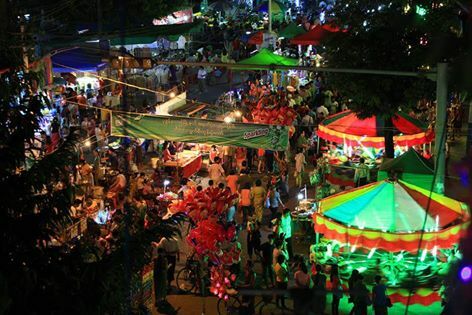 If you have time for the festival that stills offers the uniqueness without much crowd, Shwe Kyin is the best festival for you to participate. The festival includes daytime rowing races with beautifully decorated boats in the river. When the sun sets, the beautifully decorated Karaweik Barge which carries the image of Lord Buddha and the Stupas of Shin Upa Gotta monk turns right three times to accept the homage of the people's worshipping. There are countless oil lamps in the river will set free into the river. The stupa of Shin U Pa Gotta from the Karaweik Barge is also moved to the bamboo raft, which is covered by the bamboo fence and then set adrift. It is believed that the setting of Shin U Pa Gotta Stupas in the river will save and protect the people who make a living on the water. An exciting festival focused on a huge Buddha image carved from a single block of marble is the biggest Pwal Zay (Pagoda Festival) in Mandalay which also coincides with an annual competition among teams of cane-ball (chin-lone) players. This year there will be 400 booths in the festival and thousands of devotees and locals will participate in the festival. A food offering ceremony for more than 4000 monks will also take place during the festival. Approximately 25 miles away from Mandalay, is Kyauk Se where you could find dancing elephants on the full moon day of Thadingyut. A huge but light elephant figure is made with bamboo and paper in which men take their places and dance around the town. 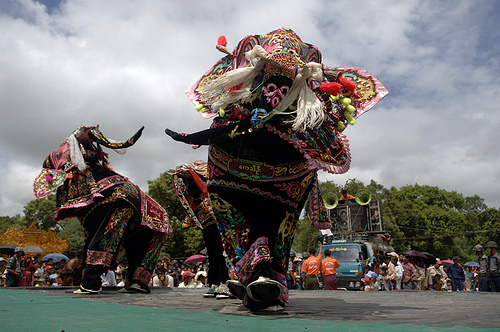 The dancing elephants will circle three times at the foot of the hill to pay homage to the Shwethalyaung Pagoda. The elephant with the best dance performance and behaviors wins the gold. The celebration of lighting festival is to illuminate the anniversary of Buddha's return from heaven (Savatimsa) where He had spent lent. Queen Mayadevi died after giving birth to Buddha. She was reborn in heaven. Seven years later, the Buddha went to heaven in order to express gratitude to His mother. He spent Lent (three months) there, preaching the Abhidhamma (the profound teaching of Buddha) to His mother goddess and the other gods. Lent covers a period of three months when Buddhist monks retreat. During Lent monks may not travel anywhere. 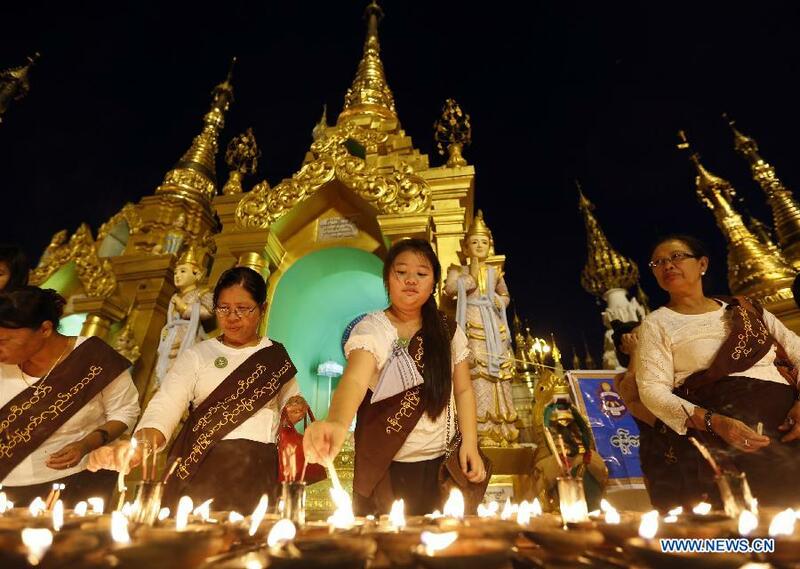 After end of the Lent on the full moon day of Thadingyut, the Buddha returned from heaven to the human world, people from all over the country lit candles to welcome Him back. As years passed by, it became a tradition and a festival. This year the full moon day of Thadingyut falls on 28th October on which everyone in Myanmar celebrate the Lighting Festival of Burma. The Festival falls over a period of three days; the day before full moon, full moon day itself and the day after. Traditional lighting festival is celebrated with small earthen saucers filled with sesame oil and pieces of cotton, used for wicks. Donations are collected for charity, decoration and entertainment purposes. Roads and streets brim with amateur dancing groups, music troupes, stalls and spectators for free entertainment. Thadingyut is not only replete with festivities, but is also an auspicious time for Burmese to practice the custom of remembering gratitude. On the festival day itself, groups of young people and children can be seen walking with candles and gifts in their hands, paying respect to elders. . They ask for forgiveness if they have committed any harm and in return, the elders return love and forgiveness. In Burmese we call this Kadawt, actually it is more than paying respects or doing obeisance. For Buddhists, the Buddha, His teachings (Dhamma), Monks (Sangha), Parents and Teachers are the first to receive this honor, next are those who are older and then those to whom we owe gratitude.